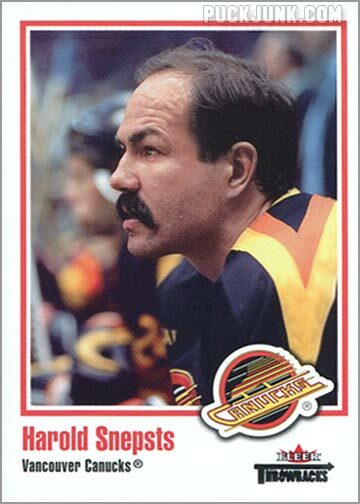 There are hockey card sets dedicated to goaltenders. 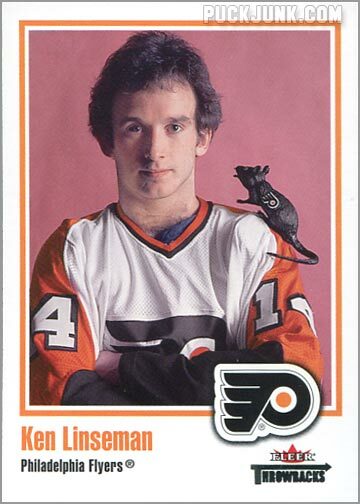 There are hockey card sets dedicated to leading scorers. And then, there’s Fleer Throwbacks. The term “throwback” implies something that hearkens back to an earlier time period or age. 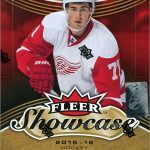 The 2002-03 Fleer Throwbacks hockey set features 91 former players who aptly fit that description – men who were tough enough to play in any era. Most of the players in this set were known for their rough-and-tumble style of play, while others were just gritty. No, this isn’t merely an homage to “goons” or “enforcers” – though Fleer Throwbacks has plenty of those, too. 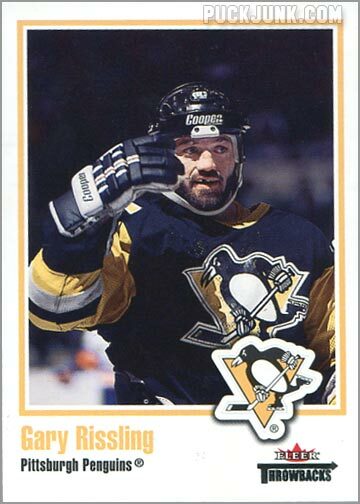 The majority of the cards in this set are of enforcers, including Marty McSorley, Dave Semenko, Tony Twist, Dave Brown, Joey Kocur, Dave Schultz and Chris Nilan. 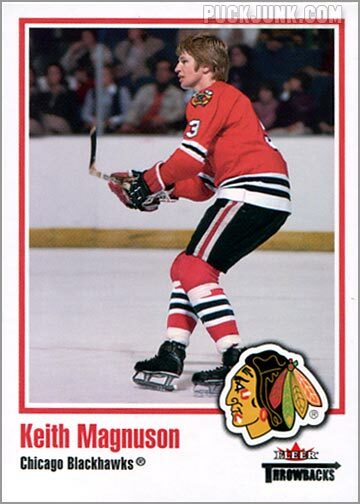 Several of the cards are of players who were known for their toughness and/or grit, such as Clark Gillies, Lanny McDonald, Steve Smith and Dirk Graham. 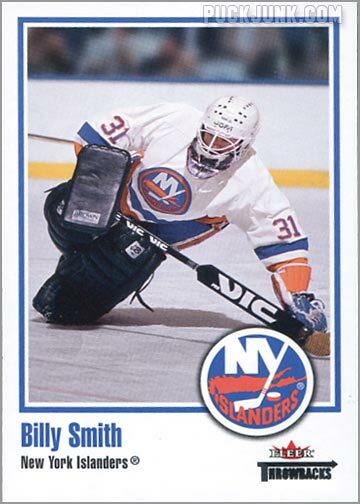 Even a few goalies make the cut: Billy Smith and Ron Hextall. No surprise there, as those guys were known to fight throughout their career. The player selection is retro, and so is the look. Fleer Throwbacks has a very simple design for a modern-era set: a photo, a team logo, a bit of text and plain white borders. Sure there’s a bit of gold foil on the front of the cards – but it is minimal and non-obtrusive. 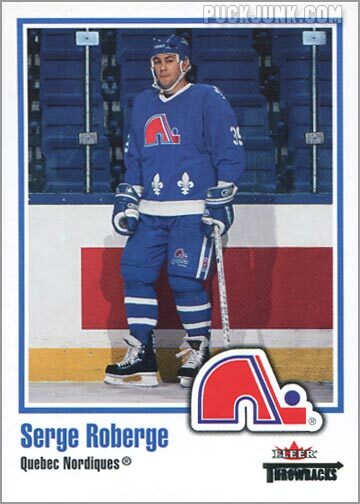 Perhaps by coincidence, but more than likely not, the set bears a striking resemblance to the 1981-82 Topps Hockey set. Too bad the designers didn’t push that resemblance further; the Fleer Throwbacks logo would have looked much better in the upper-left corner (mimicking the logo placement in the ’81-82 Topps set) instead of tucked under the team logo. The photos themselves are an interesting mix of action shots, close-ups and portraits. Sadly, no one is shown fighting, roughing or even throwing a check. Just like any good “throwback” card, the Fleer Throwbacks set gives all of the player’s vital information: height, weight, date of birth, birthplace and shoots (left or right). 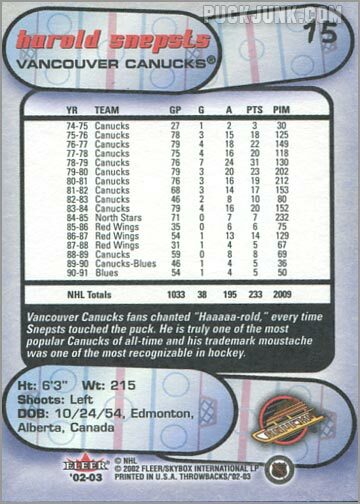 Their complete NHL statistics are also included. 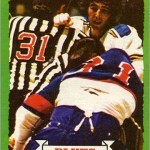 One flaw is that – just like all other licensed NHL trading cards – stats from the World Hockey Association are omitted. That is a shame, since some of these guys played longer in the WHA than in the NHL. 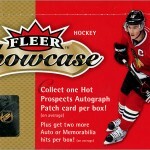 Surprisingly, the 91-card set does not include Bob Probert. 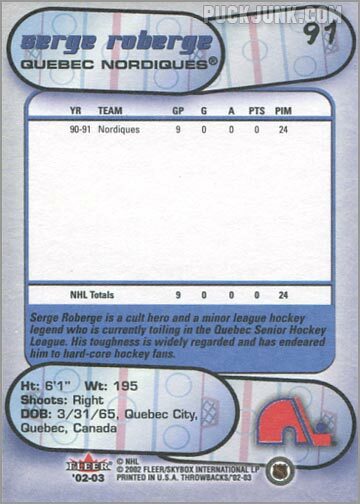 However, a Probert card was made later, and is card number 92. 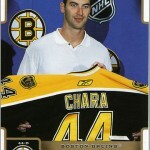 It was available via redemption at the 2003 NHL All-Star Block Party in Sunrise, Florida. 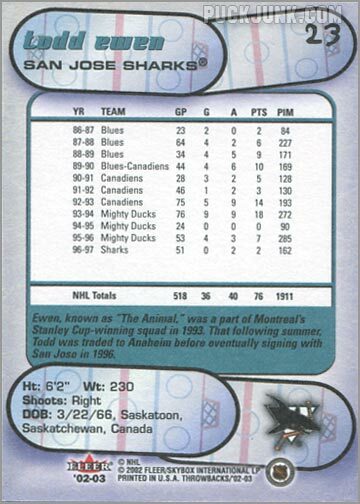 A set is still considered complete if it does not include card 92, as it was not distributed in packs and was not available to the general public. 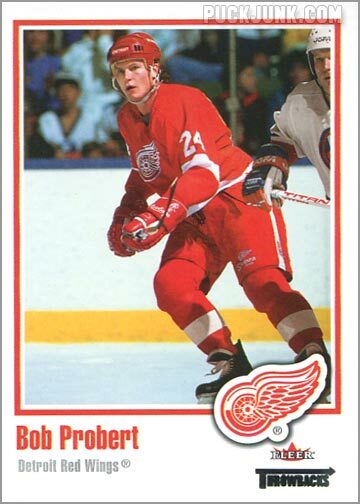 But really, what set like this one would be complete without Bob Probert? Goal scoring and goaltending may get the lion’s share of attention in hockey, but many fans fondly recall the enforcer or role player on their favorite team when they were growing up. For that fan, Fleer Throwbacks is your set. 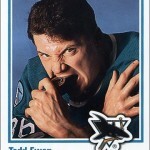 23 – Todd Ewen – Nicknamed ‘The Animal,’ Ewen is shown biting a hockey puck. This card is so awesome that it was featured here as a Card of the Week. 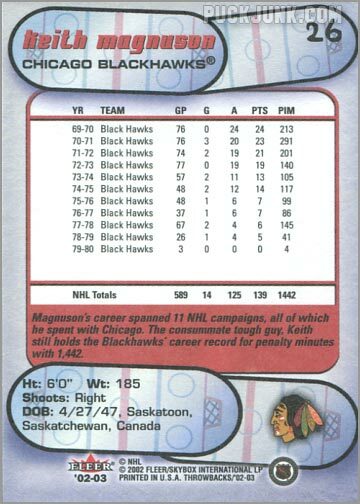 26 – Keith Magnuson – When the Chicago Blackahawks retired Magnuson’s number 3 in 2008, he became the only enforcer to receive such an honor. 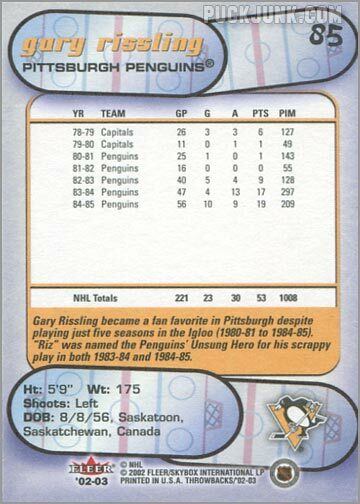 85 – Gary Rissling – This guy played seven seasons in the NHL (1978-1985), but didn’t get a mainstream card until this set. 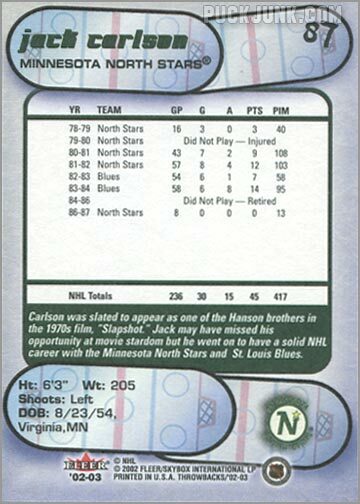 87 – Jack Carlson – One of the famed Carlson brothers that the Hansons from ‘Slapshot’ were based on. 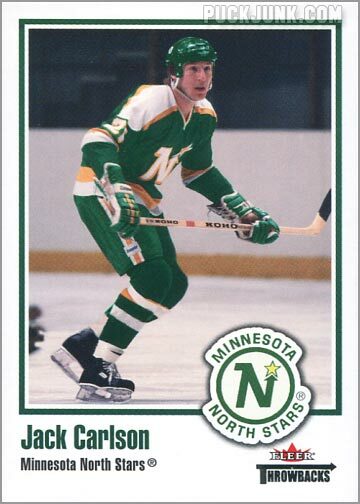 Jack was supposed to appear in the film, but opted out when he got called up to play for the Minnesota Fighting Saints of the WHA. I had never seen those, good stuff! Thanks! I wish Throwbacks would make a comeback. Maybe not every year, but every 5 years it would be a cool set to update. I haven't seen those before either, but I have to admit it's an awesome set. Nice, simple design. 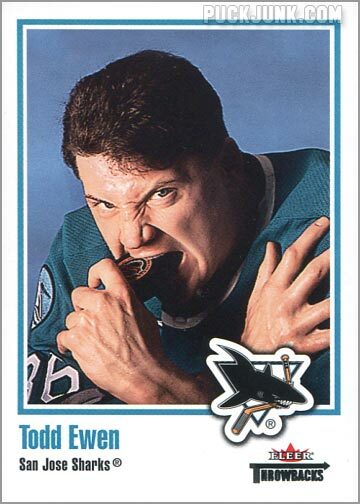 Gotta love the shot of Todd Ewen eating that puck. Thank you for sharing this to us, i haven't seen this set before and it was so interesting.